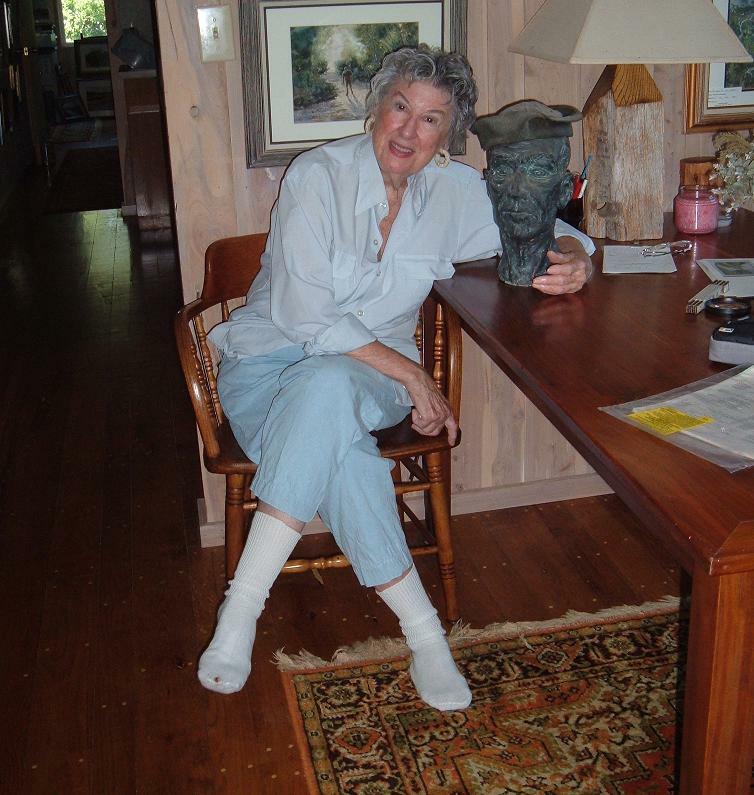 Ms. Dixie Burrus Browning with clay Coast Guardsman statue she created. Ms. Dixie Burrus Browning, grew up in a small island village known as Hatteras. She has fond memories of a childhood spent fishing and exploring what she considers today, a place that belongs to it’s people. The stories I heard today, she has passed down to her children and they to theirs. But her stories have not solely confined themselves to spoken words. No…glimpses of them are present in the years she spent as a romance writer. Her novels are mainly based on places she has been and the place she calls home. And then…there is her art. One can tell by studying her water color paintings that she truly cherishes the marshes and beaches that make up the Hatteras landscape. The various shades of blues, greens, and browns lead one down winding paths to scenes that can only be painted by someone who has studied their characteristics and kept each detail, consciously or subconsciously, in that special corner of their mind that only harbors the memories that are solely meant for safe keeping. This past year Ms. Dixie’s daughter, Elizabeth “Liz” B. Fox, donated to our society, another type of artwork her mother created sometime in the 60’s. The painted clay bust is that of a Coast Guardsman. Liz believes that it’s eyes and ears are reminiscent of her Father’s, Leonard L. Browning Jr. But after Ms.Dixie gave a quick side view glance of her profile, I can definitely state that yes…the statue does have a Burrus nose. I asked Ms. Dixie what inspired her to create the piece. The answer was quick. She didn’t know. At that time she had been doing a lot of painting and teaching art and it was quite a bit later that she sought out making a living from her talent as a writer. She never examines why she writes or paints. “The inspiration is just there and it just bubbles to the surface”, was her only explanation. It was the only one I needed. We went on to discuss the Coast Guardsman’s hat, which is real by the way. She had painted it with metallic paint and gave it a tilt as she placed it on his head. Memories of where she bought her paints and what she made them out of came back to her. As a child she would buy them from Sears. But she also found natural sources as well. Moss and poke berries were often used and she would have used Mercurochrome, if she’d of had it. Our visit lasted about an hour. It is always a pleasure to sit and listen to the stories told of how things were on the island by those who were born many years before my time. Ms. Dixie is one of our most fascinating treasures and I am very fortunate to be able to call her my “kin”. The history of this place fascinates her as it does most of us. She feels an undeniable connection to this place and it’s people. Just ask any butterfly that crosses your path (wink). Thank you again, Ms. Dixie. Perhaps we’ll visit and chat again real soon. Ms. Dixie’s original artwork and prints may be purchased at Indian Town Gallery in Frisco, NC.